Mr. and Ms. Engineering Marvin Roxas and Ana Sofia Camacho, both College of Engineering seniors, were crowned Mr. and Ms. Boston University at the annual pageant Thursday night. Roxas and Camacho were pitted against a Mr. and Ms. from each other college at BU in a competition including a fashion display and a talent show. Camacho said she was left in shock by the victory, but will not soon forget it. After meeting freshman year and becoming friends, the pair decided to enter the pageant together to bring the title of Mr. and Ms. BU back to ENG and change the common stereotype of engineering students, Camacho and Roxas said in an interview with The Daily Free Press. Contestants from ENG have not won the pageant since 2008. Roxas said the win is a coup not only for the duo, but for the whole engineering community as well as the friends and family who helped the two prepare for the competition. 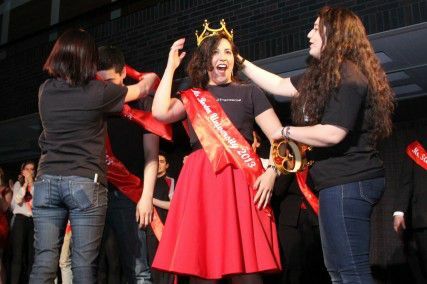 More than 260 students attended the pageant in Metcalf Hall, supporting contestants for the colleges with posters and buttons handed out by the Programming Council, which coordinates the annual event, said event manager Anna Stathopoulaos. Members of the Liquid Fun Improv Comedy group acted as hosts, and all four judges were BU faculty or staff. The competition included a fashion show with three themes: ‘Dress like your major,’ spring break wear and famous celebrity couples. After the fashion show, contestants participated in a game show segment and a talent show. Contestants were judged on a number of criteria pertaining to each event, first-year judge Eddie Downes, a College of Communication professor, said. “What I’m looking for is just pure talent, energy, excitement, and then there’s some criteria we looked at relating to the theme of the event,” Downes said. Judges were asked to critique each contestant during the fashion show based on their interpretation of the theme, attitude on the stage and style, Downes said. For the talent show, the judges were asked to look for each contestant’s energy, creativity and overall performance. The game show was judged on a point system based on how many questions each team answered correctly. Despite the competitive nature, it was important for contestants to remember to have fun, second-year judge Wayne Snyder said. During the talent show portion, Camacho and Roxas performed a comedy tutorial on how to flirt with an engineering student, which led into a Latin dance and their own mix of Italian and English renditions of popular songs.